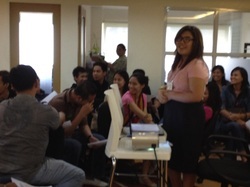 Biz Whiz believes a company’s teambuilding should be more than just games. Teambuilding should be tied to your company’s objectives and customized to enhance your values as an organization. A good example is one of our clients, the Blas F. Ople Policy Center. They are a small team tasked to handle urgent and stressful problems in behalf of our overseas workers. When they requested our services, we took the time to talk to them and ask what their biggest challenge as a team is. Camaraderie was not an issue—everyone got along great. Their biggest challenge was in setting boundaries and knowing what their roles were in relation to the Center’s mission and vision. Based on their needs, the teambuilding program we designed for them focused on aligning each individual’s understanding of the role they play in the team. They had fun, but we also managed to achieve management's objective!